"Bespoke" framing is where we make a mount and/or frame to a desired specific size/style to suit your artwork where a readymade solution may not be suitable. 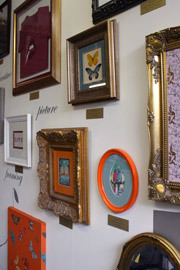 Our bespoke service provides the perfect handmade frame for any item. Visit our showroom for free expert design and framing advice, spending as long as you need experimenting with and choosing from our extensive range of mount and moulding options. Whether you’re looking for a purely aesthetic and design-led framing solution using specific colours or a particular overall size, Cambridge Framing Centre can help. Our Fine Art Trade Guild-commended framer knows all about long-term protection of artwork and will make sure your conversation requirements are catered for. Please see conservation framing for more information.